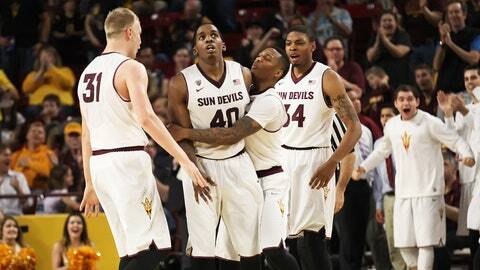 ASU players celebrate in the final seconds of Saturday's 78-60 win over Cal at Wells Fargo Arena. TEMPE, Ariz. — Arizona State all but certainly put itself in the NCAA tournament with a decisive victory over California on Saturday, although the Sun Devils refused to come right out and say it. Arizona State sent six seniors — and NBA draft early entrant Jahii Carson — into the final week of the regular season with an impressive 78-60 victory in the final regular-season home game this year at Wells Fargo Arena, finishing a week in which the Sun Devils also dispatched contender Stanford with relative ease. "We know we have a pretty much solid (NCAA) lock, but we want to finish it out," Carson said. "We’re never satisfied." Looking much more like the team that beat No. 2 Arizona on Feb. 14 than the one swept in the Rocky Mountains last week, the Sun Devils (21-8, 10-6) went to bed Saturday night closer to second place than to fifth in the Pac-12 entering a trip to the Oregon schools that begins Tuesday in Eugene. The top four league finishers will get a bye in the first round of the Pac-12 tournament. "The team has a lot of team confidence. We believe that we are going to win," said junior Jonathan Gilling, who tied a season high with 15 points and made his first six field-goal attempts. "We have players that have individual confidence, but now I feel like we are good enough to win the whole Pac-12. That’s the biggest thing for us — playing together. That allows us to do so much more on offense instead of just standing around in the corners." Jermaine Marshall, one of the seniors honored in an emotional pregame ceremony, had 22 points and continued his personal destruction of Cal (18-11, 9-7) this season. He went 6 of 8 from 3-point range, making four in the second half as the Sun Devils turned a five-point halftime lead into a 68-48 edge with six minutes left. Marshall went 9 of 13 from 3-point rangeagainst Cal this season, and his trey with 17 seconds left in regulation sent ASU’s eventual 89-78 victory on Jan. 28 in Berkeley into overtime. "That’s what he’s been doing all year — making shots," said Cal guard Justin Cobbs, who had 15 points. "If you are not going to guard shooters, you might as well not even come out and play defense." Marshall came to ASU with the specific goals of spending his final year of eligibility with Carson and making the NCAA tournament. The Sun Devils’ record and their No. 30 RPI ranking should check off the second box. "I’ve just been enjoying the ride," Marshall said. "I’m just happy I came. A lot of times when it’s a big game, I just try to tell myself to relax. To me, every game is a big game. The more I can relax, it helps me a lot. Just take a deep breath and get ready for the game. We’re just going to keep pushing and try to get to the NCAA tournament." With Marshall and Gilling leading the way, the Sun Devils shot 52 percent from the field while holding the Bears to 42 percent. With its trademark ball movement, ASU made 15 of its first 18 field-goal attempts in the second half. "When they’re open, they find the open man," Cal coach Mike Montgomery said. "The ball moves — bang, bang, bang — and when you try to help, they find the open guy." Carson and Jordan Bachynski, the other ‘Jamigos,’ were involved in different ways. Cal pinched on defense to keep Carson from penetrating after watching him score 26 points in the 76-64 victory over Stanford on Wednesday, so Carson became more of a facilitator. He had nine points, four assists and one turnover, finishing the season sweep with 35 points, eight assists and two turnovers. He announced before the season that his would be last year at ASU, so his confirmation Saturday was hardly news. "There’s a right time to go, and there’s not a right time to go," Carson said. "Last year wasn’t the right time. You don’t want to take too long. The team is better. Don’t have to do as much. The perfect time." Bachynski, a senior, added eight points, seven rebounds and four blocked shots in his final home game. He blocked two shots on California’s third possession to give him the Pac-12 season record with 121, breaking his own record of 120 set last season. He now has 123. "It’s been a really long road, but it’s been fun," Bachynski said. Jahii Carson and Bo Barnes did the majority of the defensive work on Cal guard Justin Cobbs, who had four field goals in the first 13 1/2 minutes but only two the rest of the way. — Calaen Robinson, perhaps the top contender to take Carson’s point guard spot next season, supplied some energy off the bench against the Bay Area teams. He made a 3-pointer in each game and also had two assists and a steal in 10 total minutes. — Jonathan Gilling had his best game of the season. Not only did he have 15 points but he added five rebounds, four assists and no turnovers in 33 minutes. — After Barnes hustled to save an offensive rebound and find Shaquielle McKissic with a pass, McKissic drove the baseline for a tomahawk slam, bringing the crowd to its feed and giving ASU a 14-point lead. 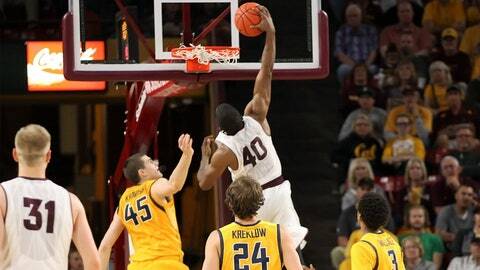 — Barnes continues to provide a spark off the bench. He had five points, six rebounds, four assists and two steals in 20 minutes.